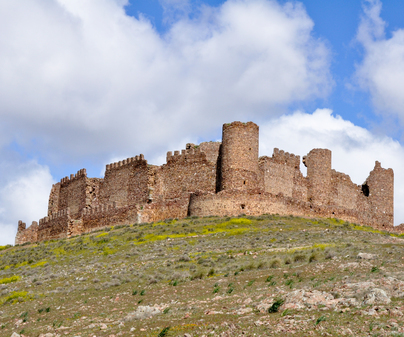 From whichever point you near Almonacid de Toldo and from dozens of kilometres away, raised on a promontory, as if it still defended the road to La Mancha, you can make out the figure of this castle. It is a good example of a 14th century castle, destined to be a permanent residence for troops and constitute a military town of vigilance and defense. Completely surrounded by a moat, narrow and nowadays not very deep, but significant in its whole perimeter. The fortress consists of an exterior wall, an interior enclosure, and a central turret. It is constructed with stone masonry and adobe brick, offering well worked ashlars in some corners of the wall and in the central tower, where almost all the stones were extracted for diverse uses in the town. In the interior we find a big parade, with remains of cisterns(aljibes), remains of a silo to store grains, and some rooms. Also there is the tower keep, with three floors. The interior of the walls of the interior enclosure are thick adobe and the domes of the towers are of brick. The first documented reference to this tower is of Muslim origin and dates back to the year 848. In the 11th century it passed into the hands of Alfonso VI as part of the dowry to his wife Zaida, daughter of the Moorish king. Later, Alfonso VI donated it to the Cathedral of Toledo, and was reformed in the 14th century by Archbishop Don Pedro Tenorio. In the times of Juan I of Castile, it served as a prison for 8 years to the prince D. Alfonso. In modern times, it lived through a military battle in 1809, during the War of Independence. In its surrounding areas there was a great battle among the troops of the Spanish general Venegas and the French troops of Sebastián, Desoyen and the very José Bonaparte. The French took the castle, destroying part of it when they left. Entrance is free, and can be accessed by foot or in vehicle via a dirt road. 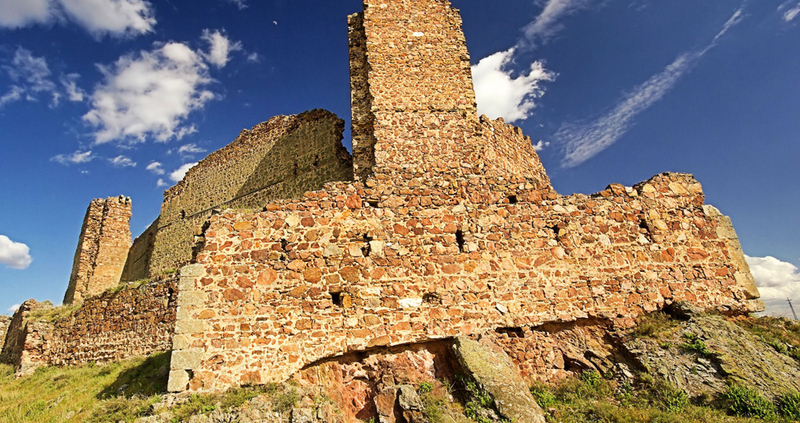 A report from the architect Don Pedro Gumiel, in the 16th century, tells us that the castle had, at the time in which he was planning reforms, various water deposits, bakery, silos and even a great room with a chimney of seventy square meters.